Congratulations to IMACS graduate Nik Kaufman who is excelling in the Medical Honors Program at the University of Florida College of Medicine. 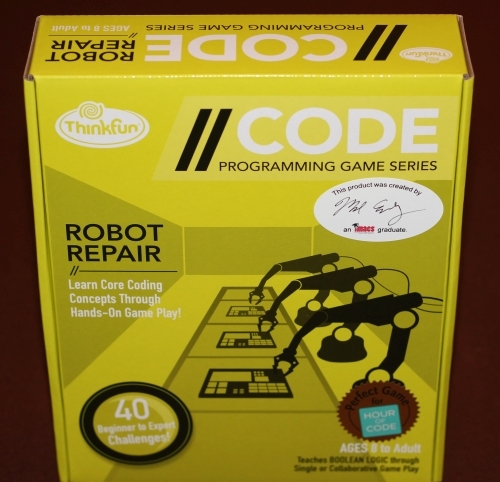 Nik attended IMACS from 1st through 12th grade and completed Math Enrichment, Computer Enrichment, Hi-Tech Summer Camp, and university-level courses in Computer Science and Logic for Mathematics. He earned straight A’s in high school, scored 790 on the math section of the SAT, and was named a National AP Scholar after scoring 5’s on 13 AP exams. He also happens to be a virtuoso pianist. Nik chose the University of Florida’s Honors Program where he was selected as a Stamps Scholar in recognition of his exceptional success in leadership, service, and academics. As an undergraduate in UF’s Biomedical Engineering program, he completed research in both biomedical engineering and gastroenterology while maintaining a perfect 4.0 GPA. Nik was accepted into the UF College of Medicine’s highly selective Medical Honors Program. In only his first year of medical school, he served as the Operations Coordinator for Gainesville’s Equal Access Clinic, the largest free clinic in the country run entirely by medical students. Nik will earn both his B.S. and M.D. degrees in seven years after which he plans to complete his residency in internal medicine and then specialize in cardiology. Congratulations to IMACS graduate Shuli Jones who is beginning her studies at MIT. Shuli started taking IMACS courses in 6th grade after winning a scholarship to University Computer Science I through a coding camp for girls. She went on to complete University Computer Science II, AP Computer Science: Java Programming, and Logic for Mathematics. Shuli graduated high school with a near-perfect average of 98 and was named a National Merit Finalist. She scored a 5 on the AP Computer Science A exam and 1560 on the SAT, including 800 on the math section. 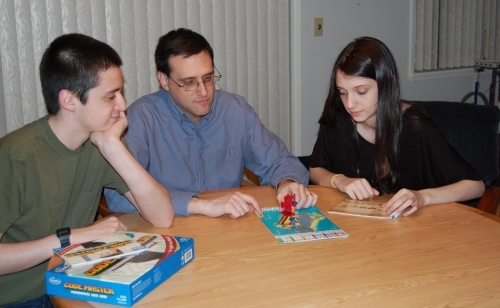 Shuli is a true Renaissance woman who competes in a wide variety of academic competitions. She and her teammates dominate the Canadian high school quizbowl circuit, most recently winning the prestigious Reach for the Top National Championship. At the annual Ontario Student Classics Conference, Shuli was named the Top Academic Pentathlete in each of her four years of high school and Top Academic Student in her senior year. Shuli was accepted to MIT, Harvard, and Stanford. 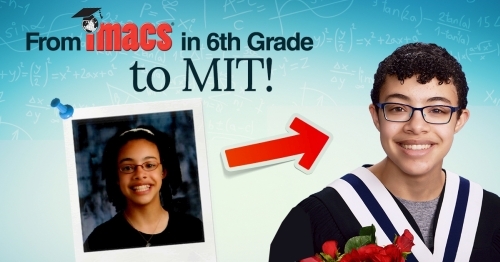 She chose MIT where she plans to major in Mechanical Engineering or Computer Science and minor in Classics. 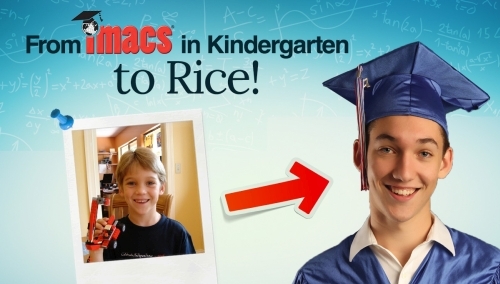 Congratulations to IMACS graduate Ricky Morse who is beginning his studies at Rice. 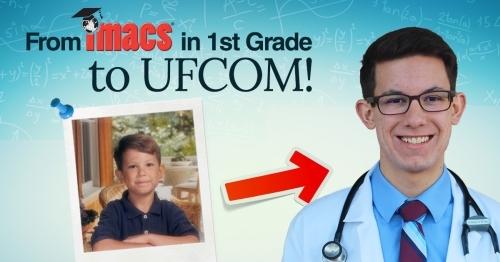 Ricky first attended IMACS in 2nd grade. 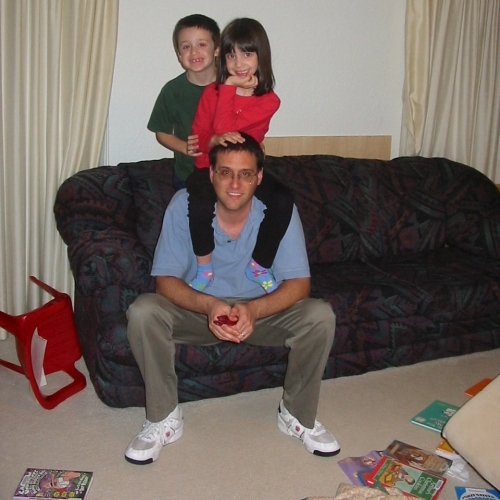 Over the next 10 years he completed all levels of Math Enrichment and Computer Enrichment, Electronics, and university-level classes in Computer Science and Logic for Mathematics. Having scored 1580 on the SAT, 35 on the ACT, 800 on the SAT II subject tests in Math and Chemistry, and 5’s on AP exams in Calculus AB, Calculus BC and Chemistry, Ricky was named a National Merit Finalist and National AP Scholar. During high school, Ricky channeled his talents and sharp focus through both academic and athletic endeavors. He qualified for the prestigious American Invitational Mathematics Examination, and he and his teammates competed in the Barry University Olympiad tournaments, earning 1st place team wins in Math and Chemistry. Ricky also works on developing ways to use computer programming to enhance research, as well as striving to improve his personal best times in track and cross-country. Ricky was accepted at Rice University, University of Florida, University of Miami with a Singer Scholarship, and University of Southern California with a Presidential Scholarship. 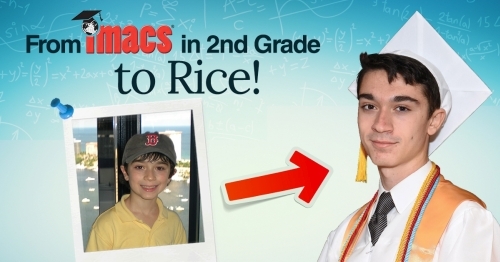 He chose Rice where he will major in Computational and Applied Mathematics followed by a Ph.D. and career in research. 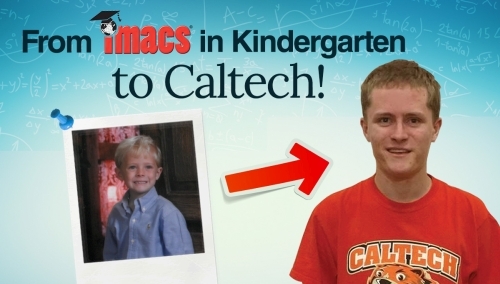 Congratulations to IMACS graduate RJ Antonello who is excelling in his studies at Caltech. RJ was an IMACS student from kindergarten through 12th grade and took every class IMACS offered, including all levels of Math Enrichment, Computer Enrichment, Hi-Tech Summer Camp, University-Level Computer Science, AP Computer Science: Java Programming, and University-Level Logic for Mathematics. 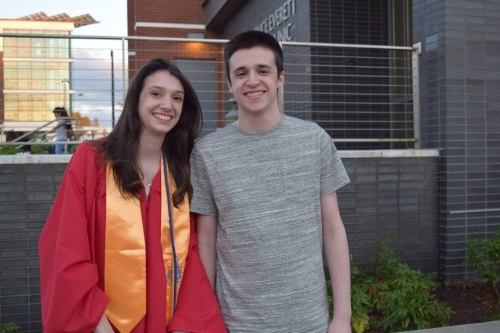 With a 5.9 GPA and 2360 on the SAT, RJ graduated as co-valedictorian and was honored as a US Presidential Scholar candidate, National AP Scholar and National Merit Scholar. He and his teammates were also four-time Science Olympiad state champions. RJ was accepted to Caltech, Georgia Tech, Carnegie Mellon, and the University of Florida. He chose Caltech where he took junior-level Computer Science classes as a freshman and served as a Teaching Assistant for those classes as a sophomore. RJ conducted summer research in computer vision and was selected for an internship at Northrup Grumman. He will graduate with a double major in Computer Science and Philosophy and plans to attend graduate school to specialize in Machine Learning. 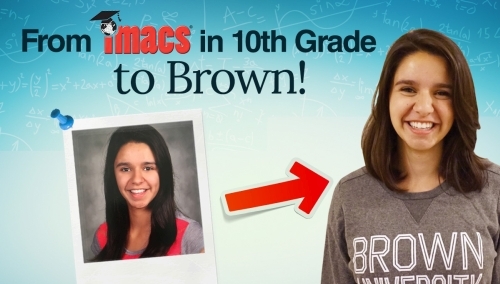 Congratulations to IMACS graduate Cori Williams who is beginning her studies at Brown. Cori wanted to understand the fundamental concepts that make up the sophisticated theories of Computer Science. She started IMACS during the summer before tenth grade and went on to complete IMACS’ University Computer Science track and AP Computer Science: Java Programming course. Cori scored a 5 on the AP Computer Science A exam, 800 on the math portion of the SAT, and was named a National Merit Scholarship Finalist. 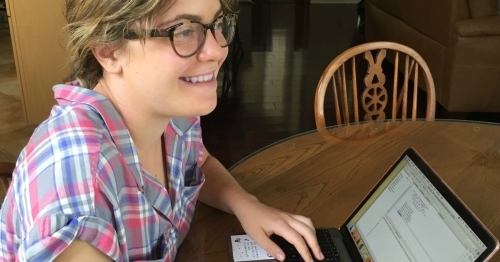 Cori’s keen interest in using her knowledge to understand real-world problems inspired her to write a Naive Bayes machine learning algorithm to detect political bias in online news articles. Her paper on it was selected for presentation at the Georgetown Junior Science and Humanities Symposium, and she was honored as an affiliate winner for the National Center for Women and Information Technology’s Aspirations Award. Cori chose Brown University where she was accepted early decision and plans to study Computer Science and Economics. She hopes to pursue a career applying data science within education or a service-based field. Congratulations to IMACS graduate Mason Janenda who is beginning his studies at Rice. 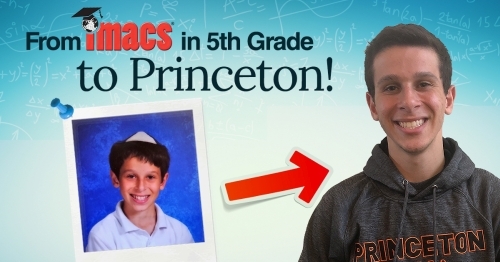 As a young child, Mason excelled in IMACS Math Enrichment classes and, in subsequent years, attended several weeks of IMACS summer camps. 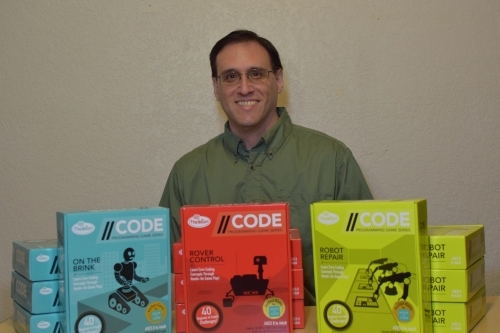 He later completed IMACS’ university-level courses in Computer Science and Logic for Mathematics. Mason was honored by the College Board’s National Hispanic Recognition Program for his achievement on the PSAT/NMSQT, and his high school mathematical modeling team was recognized by the Consortium for Mathematics and its Applications. Mason graduated high school with a perfect 4.0 GPA and 34 on the ACT. A natural at sharing knowledge, Mason enjoys tutoring students in science and math at a local homeschool co-op, co-taught a robotics class for two years, and was a Teaching Assistant for an Honors Calculus seminar. He accomplished this and more while being an all-county varsity and travel soccer player and a dual-enrolled student at a regional 4-year university. Mason chose Rice University where, at 16 years old, he was accepted early decision into the George R. Brown School of Engineering. He plans to major in Materials Science and NanoEngineering. Congratulations to IMACS graduate Snow Kang who is beginning her studies at Dartmouth. Snow began IMACS in 1st grade and completed all levels of IMACS Math Enrichment. She returned during high school to complete the IMACS University Computer Science track. Snow’s talents and keen interest in programming, civics, and service propelled her to 1st place finishes at FIU’s Google Startup Competition, Ft. Lauderdale’s Code for America Civic Hackathon, JusticeHack Miami, and Yale’s Bulldog Invitational Mock Trial Competition. In addition to being selected as a National Merit Finalist, Snow was named Cadet of the Year by the Florida Wing of the Civil Air Patrol and won 1st Place at the National Cadet Special Acts Competition. Snow credits IMACS for the way she thinks and approaches every aspect of her life. With a 5.5 GPA, 1580 out of 1600 on the SAT, and 800 on the SAT Math II exam, Snow was accepted at Dartmouth, UC Berkeley, NYU, Vanderbilt, Wellesley, and the University of Miami. She chose Dartmouth where she plans to double major in Computer Science and Economics and eventually pursue a career in cyberlaw or cybersecurity.